This is a ten-slide Power Point presentation in Spanish that teaches vocabulary terms for pollution and environmental problems in Spanish. The font is big and readable and the pictures are very easily related to the vocabulary word by students. Use this for an environmental unit in Spanish class. French Teaching Resources. PowerPoint: Environmental Problems/ The Environment. Flash cards covering the terminology that will be introduced when discussing Environmental Problems with Life Science students. There are 24 cards total. These can be used in conjunction with the Environmental Problems word search, crossword, and quiz/worksheet. Word Search covering the terminology that will be introduced when discussing Environmental Problems with Life Science students. There are 24 words total. This can be used in conjunction with the Environmental Problems quiz/worksheet, crossword, and flash cards. Quiz or worksheet covering the terminology that will be introduced when discussing Environmental Problems with Life Science students. There are 24 words total. This can be used in conjunction with the Environmental Problems word search, crossword, and flash cards. Crossword covering the terminology that will be introduced when discussing Environmental Problems with Life Science students. There are 24 words total. This can be used in conjunction with the Environmental Problems word search, flash cards, and quiz/worksheet. Presentation that covers environmental problems. It is a basic introduction to managing resources, nonnative species, pollution (types/examples). The presentation is easy to modify and change to fit your lesson. You Tube videos are hyperlinked. APES Why Do We Have Environmental Problems? APES Chapter 1 Lesson 3 Why Do We Have Environmental Problems? Miller 17th Edition PowerPoint Presentation. Can be used in direct instruction or as a flipped assignment. 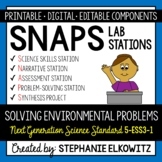 Graphic Organizer to organize research of an environmental problem such as pollution along with places to include possible solutions and sources where information was found. Information can then be written into an essay or given orally as speech activity. APES Chapter 1 Lesson 3 Why Do We Have Environmental Problems? Miller 17th Edition fill-in-the-blank note outline to correspond with C1L3 PowerPoint Presentation. Can be used in class or as a take home flipped assignment. PowerPoint Presentation that can be used for direct instruction or flipped classroom assignment. Created for use with AP Environmental textbook Miller 17th Edition, but can be adapted.